Voyages Indigenous Tourism Australia operates the Sounds of Silence dinner and its run very well. The money raised from Voyages business activities goes back into the Voyages businesses which aim to provide indigenous training and employment opportunities. The aim is to provide training and development for Indigenous staff in hospitality. Booking for the Sounds of Silence Dinner needed to be made well in advance, I booked ours about 6 months out! The AAT Kings Coach picks up from the 4 accommodation locations at the Ayers Rock Resort and transports everyone to the location. This is fabulous as it ensures everyone is then able to enjoy a few drinks (if you wish). The location of the dinner is approx. 30 kms from Uluru and you arrive at the viewing platform approx. 30mins before the sunset. Uluru is one of of Australian most iconic tourist attractions. 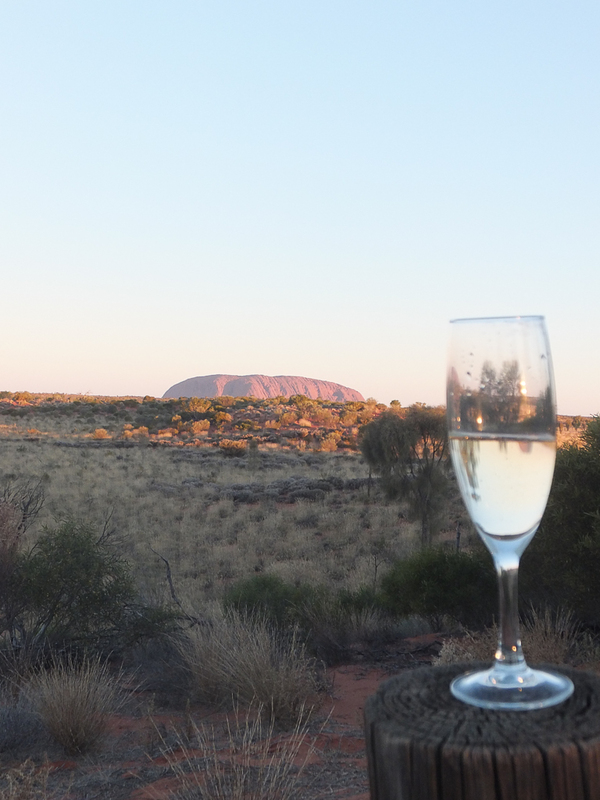 Upon arrival you are greeted by the evening’s event manager and wait staff serve guests with champagne and canapés while watching the evening light fade over Uluru. Uluru went a very deep orange colour as the shadow covered the rear of the rock. Its a very beautiful sight, you can then understand why people come from all over the world to view it. 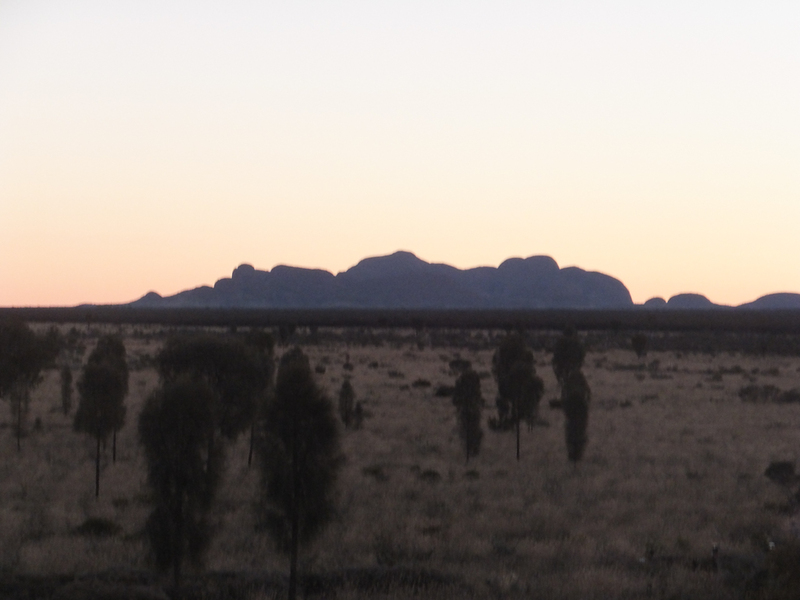 You could also see Kata Tjuta (The Olgas) in the distance, the sunset behind Kata Tjuta was breath taking. A local Aborigine plays the didgeridoo in the background which assists with setting the ‘all Australian’ mood. Once the sun set, we were ushered to the dining area where tables were set up in fine dining atmosphere. The tables were set for 10 guests. We had a variety of Europeans and one other Aussie at the table. Great bunch of people and we had a wonderful experience even though a couple of them were really struggling communicating in English. Craig was having a ball trying to hold a conversation with the Italian couple sitting next to him and he has been in contact with them via Facebook since. The beverages were regularly topped up and I couldn’t fault them on the drink service. The International guests on our table were disappointed with the quality of the wine and for the price paid for the evening had expected a good showcase of our best wines. I chose not to drink as we had a very early start heading to Kings Canyon. The buffet meal was nice and there was plenty of Australian produce displayed. The international guests were impressed with the opportunity to taste Aussie animals such as crocodile, kangaroo, barramundi & quandong. The meal was lovely and there was plenty to choose from, soup was provided for entrée, then a help yourself buffet including lamb cutlets, chicken, beef, rice & vegetables. The meal was impressive considering the environment and I am sure no one left hungry. The dessert buffet was also great with cheesecake, chocolate cake, sticky date pudding and an excellent fruit platter. The entertainment for the evening was a traditional Aboriginal welcome dance containing a brief history of the spiritual meaning of Uluru to the Aboriginal people. The Aboriginal dancers come out of the scrub and complete 3 welcome dances. I found it amusing that after the welcome dances the 3 Aboriginal guys departed the area in a ute! So totally Australian! We then had an astronomy talk from a professional star gazer. His talk was extremely informative and he had a good sense of humour. Everyone at our table enjoyed this part of the program. At the conclusion of the talk the astronomer had a telescope set up and we were all able to view Saturn through the telescope which was amazing. You can’t really explain just how beautiful the sky is up there and I have never seen the Milky Way so clearly. It really is the best time to be up there but just a warning, it does get really cold, temperatures are known to drop below 0 degrees at night this time of year. Craig and I discussed whether it was worth the $198 that they are asking for this (I got a discount off this by booking through Viator) and we decided that whilst the food was nice it wasn’t worth that amount of money but we did agree that the experience was worth what we paid for it. So would I recommend it – yes, definitely. 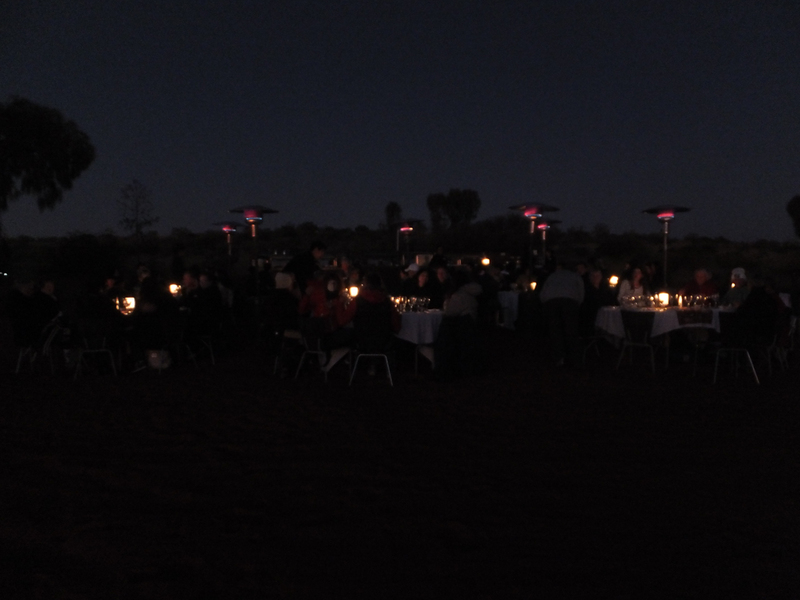 We met some lovely people, the star gazing was brilliant, the food was fine and the views were awesome. While staying in the Ayres Rock Resort, we chose to stay at the Ayres Rock Campground in the cabins which was a very cost effective way to visit the Rock. The Resort has a monopoly at Uluru and the room rates are very much inflated for what they are. 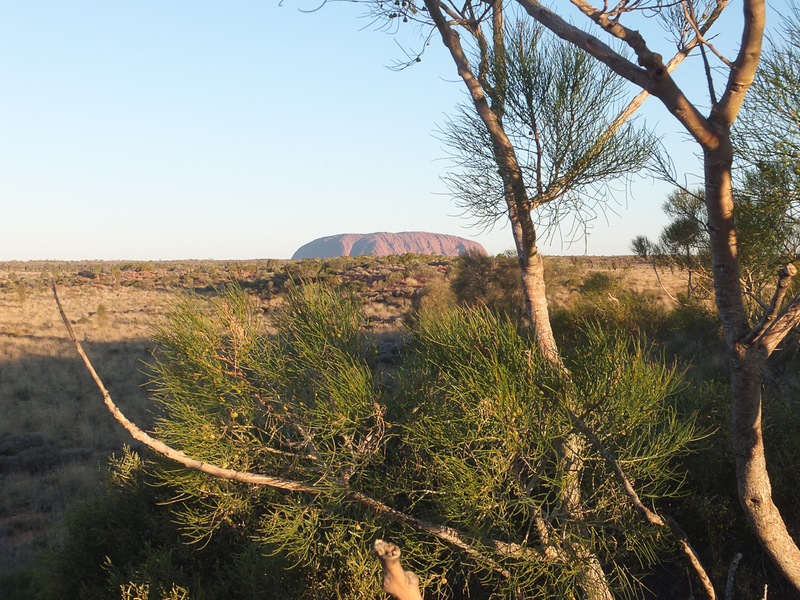 This is a great post for those looking for something more focussed on visiting Uluru and has great information. Interesting to read of you trip to Uluru. I have been thinking about a visit to this ancient rock for some time, so its good to get insight on what one can expect. Sounds pretty good. Is the stargazing on the agenda all the time, as I would really enjoy that experience too? Do it, you wont be disappointed. I found the experience to be everything everyone has ever said and more. Everyone talks about the size and how you will be blown away and at first I was not overwhelmed but by gosh when I got up close it, it really blew me away! I loved Kings Canyon as well so if you can fit that in make sure you do. Also I wouldn’t visit in summer, August was perfect, we had lovely days and best of all, no flies!